Show your support for writers, and help bring a book into the world. For a limited time, we’re running a special tote bag sale hosted at Custom Ink featuring a hand-lettered design by Keiko O’Leary. 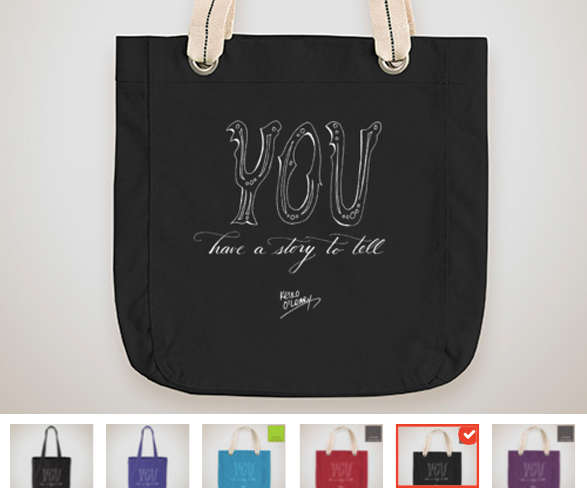 From Nov 2 through Nov 17, you can order canvas tote bags featuring the message You have a story to tell. Keiko O’Leary is one of the founders of Thinking Ink Press, where she writes, edits, and designs our limited edition hand-folded books and flash fiction postcards. Keiko leads the Write to the End writing group and teaches writing workshops, including a free poetry series at the Sunnyvale Library. If you’re in the South Bay, you may run into her at literary events like Flash Fiction Forum, literary pub crawls, or demonstrating how to create hand-folded art books. Proceeds from this sale will be used to publish and promote a short book of essays by Keiko. The book focuses on encouragement and insights for writers, and it will be published in 2019. Any additional proceeds will fund Keiko’s Thinking Ink Press publishing wish list. To contact Keiko directly, email her at keiko@KeikoOLeary.com, or visit KeikoOLeary.com. Order your tote bag now and show your support!